Living Lagom Shawl is about happy and balanced life. Slightly asymmetrical it combines chunky cables with lace parts. For additional softness and comfort. Enjoy! dc (double crochet): yo, insert hook in indicated st, yo, draw up a loop, [yo, pull through 2 loops] twice. BPdc (back post double crochet): yo, insert hook from back to front to back around the post of indicated stitch, yo, draw up a loop, [yo, pull through 2 loops] twice. 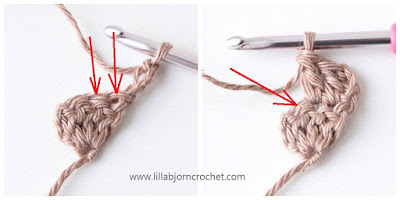 FPdc (front post double crochet): yo, insert hook from front to back to front around the post of indicated stitch, yo, draw up a loop, [yo, pull through 2 loops] twice. FPtr (front post treble crochet): yo twice, insert hook from front to back to front around the post of indicated stitch, yo, draw up a loop, [yo, pull through 2 loops] 3 times. FPtr2tog (front post treble crochet 2 together): *yo twice, insert hook from front to back to front around the post of indicated stitch, yo, draw up a loop, [yo, pull through 2 loops] twice* twice, yo, pull through all 3 loops on hook. FPtr3tog (front post treble crochet 3 together): *yo twice, insert hook from front to back to front around the post of indicated stitch, yo, draw up a loop, [yo, pull through 2 loops] twice* three times, yo, pull through all 4 loops on hook. sc (single crochet): insert hook in indicated stitch, yo, draw up a loop, yo and pull through both loops on hook. 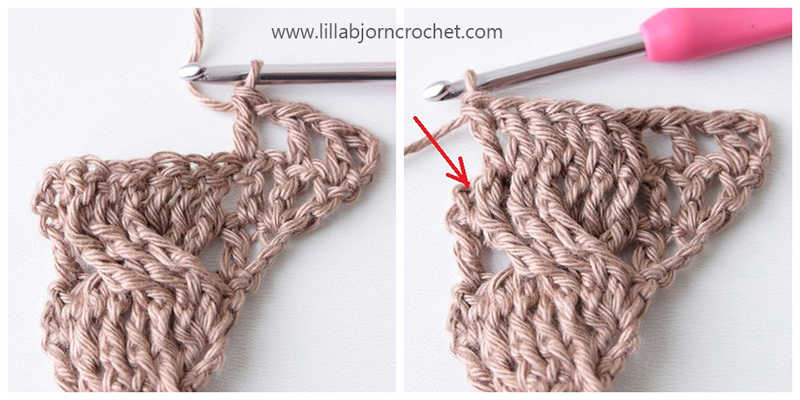 ss (slip stitch): insert hook in indicated st, yo, draw yarn up and pull second loop through the first loop on hook. Purchase ads free ready-to-print pdf with full written instructions and photo-tutorial HERE on Ravelry and HERE on Etsy. Paid pdf also includes two bonus CHARTS! Rows 19-66: Repeat rows 15-18 12 more times (you’ll get 16 twists in total of large cable) – 59 dc, 10 BPdc, 2 sc, 4 ch3-sps. Row 79: Ch4, dc in first st, [ch1, skip sp, dc in next st] x3, *[ch1, dc in next sp] twice, ch1, dc in next st* until first BPdc, ch1, [FPtr2tog over next 2 sts] twice, ch1, dc in next dc, [ch1, dc in next sp] twice, ch1, dc in next dc, ch2, [FPtr3tog over next 3 sts] twice, ch2, ss in last st.
Fasten off. Block shawl to measurements. Congratulations! 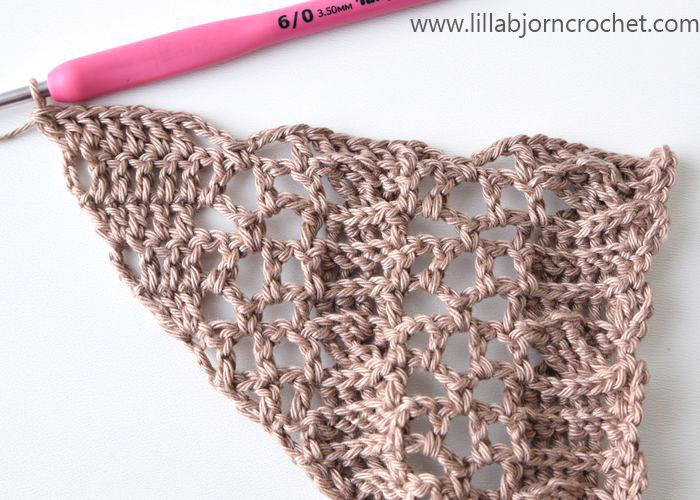 Your Living Lagom shawl is now finished! Purchase ads free ready-to-print pdf with full written instructions, photo-tutorial and CHARTS HERE on Ravelry and HERE on Etsy. Thank you for another great pattern. Beautiful!! 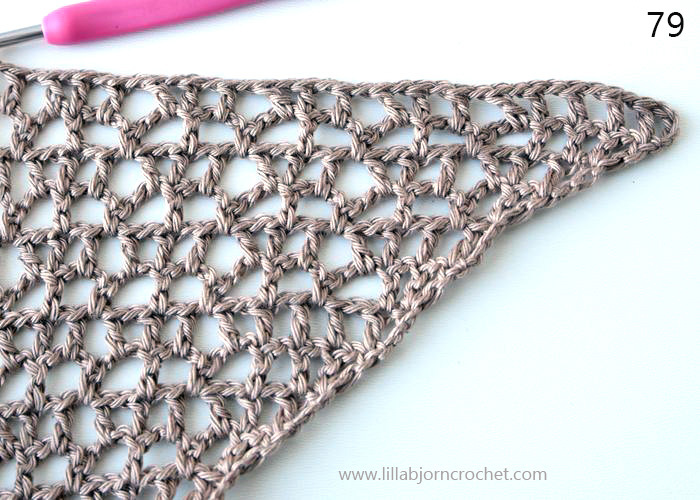 I love the contrast of of the lacy stitches with the cabling!! Thank you!!! 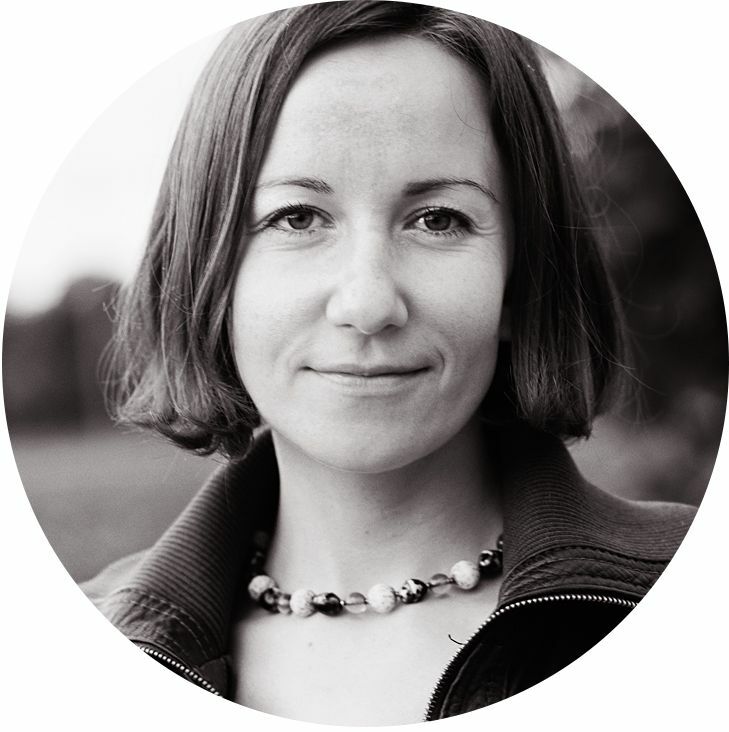 Oh Tatsiana, you are such a wonderful designer! This is just what my special yarn has been waiting for, the perfect throw for my cold shoulders! Thank you so much for making this a free pattern and for sharing the concept of the word. I will use my shawl to live Lagom! 💜 Can't wait to get started! Thank you for this pattern, just the thing I needed for my Daughter-in-Law's birthday gift. What a great pattern. With the namaste yarn how is it against the skin. I can’t normally wear wool as it irritates my skin?? For me Namaste yarn feels very soft and not scratchy... But my perception is personal. Gorgeous shawl. Thank you so much for sharing this pattern. I can't wait to get started crocheting this beautiful pattern. Thank you for sharing. 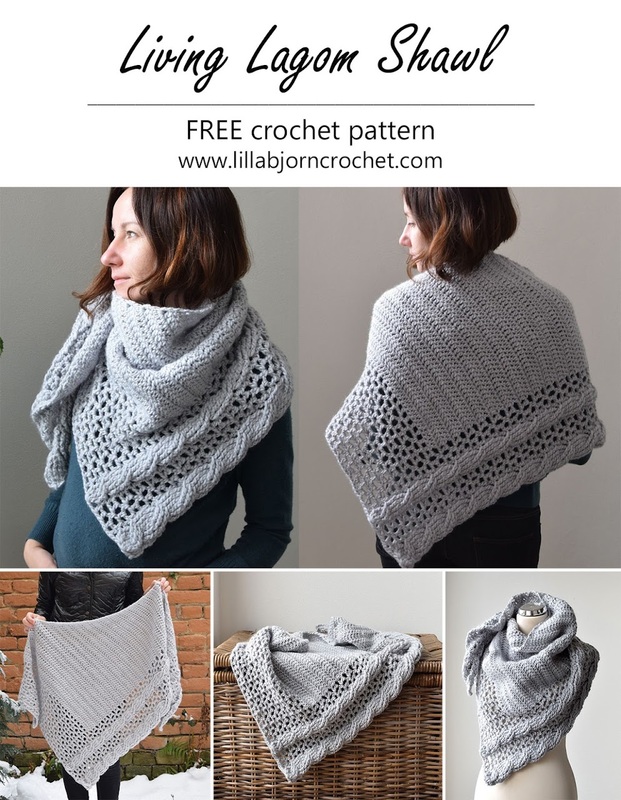 Thank you so much for this free pattern; it is gorgeous. If I'd like to make it larger, can I just repeat rows 15 through 18 more times? Thank you. Yes, to make it larger you should just continue with pattern repeat. But because you'll get a different stitch count before lace edge, you'll need to experiment with placement of lace stitches a bit.